Çoban Salatası or Choban salad (Turkish for "Shepherd's Salad") is a salad found in Turkish cuisine consisting of finely chopped tomatoes (preferably peeled), cucumbers, long green peppers, onion, and flat-leaf parsley. The dressing consists of lemon juice, olive oil, and salt. ^ Wright, C. (2003). The Little Foods of the Mediterranean. Harvard Common Press. p. 239. ISBN 978-1-55832-227-1. Retrieved December 22, 2017. ^ Akin, E. (2015). 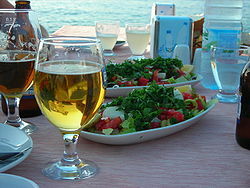 Essential Turkish Cuisine. ABRAMS. p. pt126. ISBN 978-1-61312-871-8. Retrieved December 22, 2017. ^ Swan, S. (2010). DK Eyewitness Travel Guide: Turkey. DK Publishing. p. 350. ISBN 978-0-7566-6495-4. Retrieved December 22, 2017. ^ Shore, R.; Shore, D. (2017). Home and Away: Simple, Delicious Recipes Inspired by the World's Cafes, Bistros, and Diners. Arsenal Pulp Press. p. 88. ISBN 978-1-55152-674-4. Retrieved December 22, 2017. ^ Shales, Melissa (2013-06-03). Top 10 Istanbul. DK Publishing. pp. 82–. ISBN 9781465413154. Retrieved 5 March 2015. This food-related article is a stub. You can help Wikipedia by expanding it.